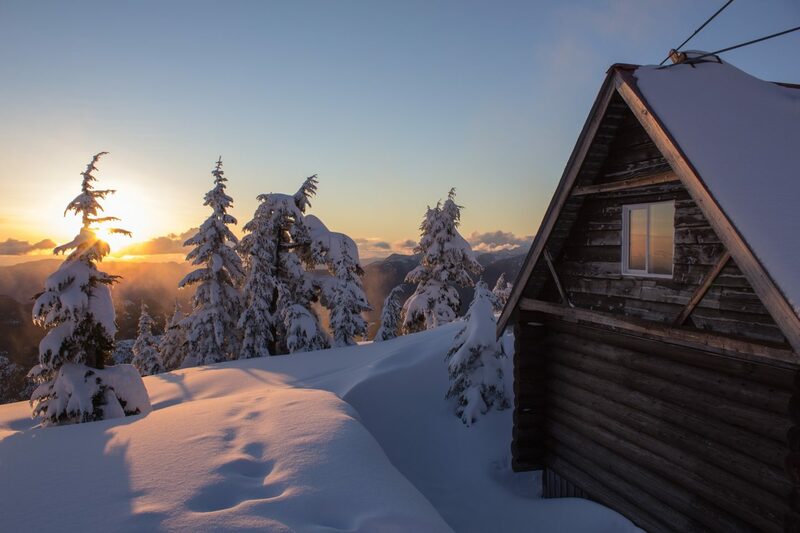 Winter on the Sunshine Coast is generally mild compared to most of Canada, but don’t let the rainy pacific-northwest vibe fool you – there are great stashes of snow for backcountry adventures, quaint cabins with ocean view hot tubs, and a variety of different events that offer something for everyone. The winter rains that come typically from November to March keep the scenery green and the waterfalls flowing. It usually doesn’t take more than a 20 minute drive up the mountains to reach the snow, and the temperatures sit between 2 and 10 degrees Celsius (35-50 F) during the day. Speaking of snow, the communities along the Sunshine Coast are situated very close to sea level, and thus receive minimal snowfall on a typical year. That said, the neighboring terrain is mountanious and it doesn’t take long to reach the snow line for those that seek it. Visitors to the Powell River region can enjoy the snow along the higher elevations of the Sunshine Coast Trail, such as Tin Hat Mountain, or in the Knuckleheads. Both areas have winterized sleeping huts for those prepared to winter camp. On the southern Sunshine Coast, snow afficiandoes can enjoy Dakota Ridge winter recreation area, which boasts 20km groomed nordic ski trails and 7km snowshoe trails. Local outfitter Alpha Adventures offers shuttle service, tours, lessons, and equipment rental. Other popular regions for more backcountry exploration include Mt. Elphinstone Provincial Park, Tetrahedron Provincial Park, and the Caren Range. Accommodations on the Sunshine Coast are mostly open year-round. You can search by date for available accommodations with our booking engine, or check out the Business Directory for a full list. Many of the winter recreation areas mentioned above also boast backcountry cabins and lodges, that are available on a first come-first serve basis, and by donation to the local volunteer organizations that maintain them. More details can be found on the links to the specific areas above. One of most popular activities in the winter on the Sunshine Coast is to head outside and enjoy the lush rainforest. Even on a rainy day, the canopy overhead often provides a bit of shelter from the drizzle and the greenery is stunning. Pick a trail with a waterfall or creek and you are sure to enjoy the extra waterflow that you don’t often see during summer hikes. Popular choices include Cliff Gilker Park, Langdale Falls, Homesite Creek, Kelly Falls, Eagle Falls, and David Lam Falls. There’s lots of ways to enjoy winter on the Sunshine Coast, but overall we like to take a cue from the Danish term “hygge”; encouraging visitors to embrace the winter vibes and that special feeling and conscious appreciation of feeling cozy, and enjoying the moments of life which are charming and special whether with friends or alone, ordinary or extraordinary, Sometimes on a colder, dark day, hygge is the feeling you get from sitting by the fire with a hot drink. Other times it’s about simply basking in the rainforest (forest bathing, as some call it). Overall, it’s about being aware of the good moments and enjoying the season. Maybe book a spa treatment, plan a homecooked meal with friends, or find a quiet moment of solitude in the trees. So come visit and connect mind, body, and soul through a winter retreat to the Sunshine Coast. If you’re visiting during the winter, be sure to check the events calendar for what’s happening while you visit. During November and December you’ll find loads of Christmas markets and craft fairs, plus festive celebrations in each community, like the Tree Lighting in Pender Harbour, or the Santa parades in Powell River and Sechelt. On New Year’s Day you can live like a local if you’re willing to take the plunge in the Polar Bear Swim, and February’s don’t miss event is the annual Powell River Film Festival. See the full events calendar > for more great events in the winter. Try out this dream winter itinerary for an escape to the Sunshine Coast.